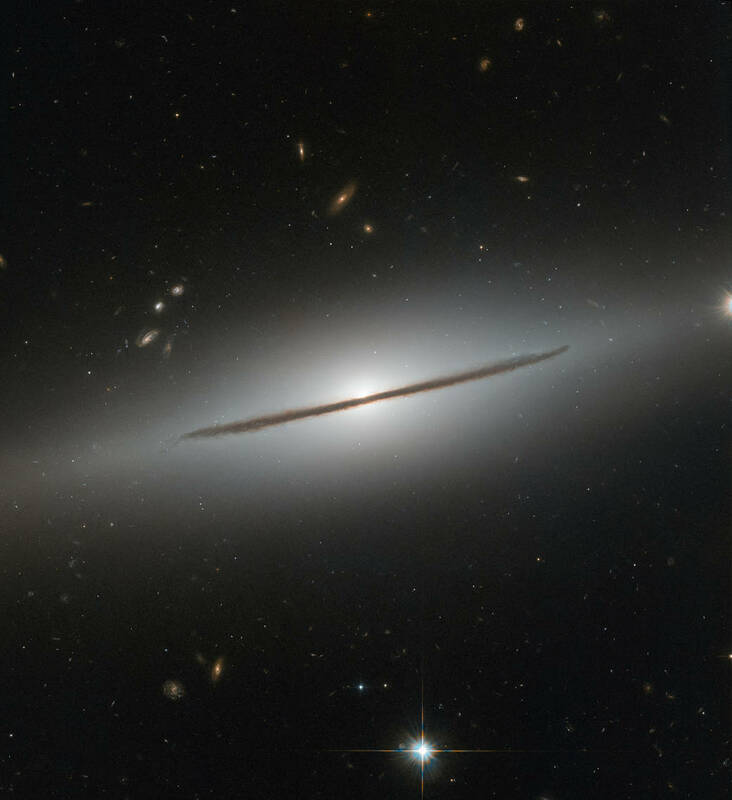 Resembling a wizard’s staff set aglow, NGC 1032 cleaves the quiet darkness of space in two in this image from the NASA/ESA Hubble Space Telescope. NGC 1032 is located about a hundred million light-years away in the constellation Cetus (the Sea Monster). Although beautiful, this image perhaps does not do justice to the galaxy’s true aesthetic appeal: NGC 1032 is actually a spectacular spiral galaxy, but from Earth, the galaxy’s vast disk of gas, dust and stars is seen nearly edge-on. A handful of other galaxies can be seen lurking in the background, scattered around the narrow strip of NGC 1032. Many are oriented face-on or at tilted angles, showing off their glamorous spiral arms and bright cores. Such orientations provide a wealth of detail about the arms and their nuclei, but fully understanding a galaxy’s three-dimensional structure also requires an edge-on view. This gives astronomers an overall idea of how stars are distributed throughout the galaxy and allows them to measure the “height” of the disk and the bright star-studded core.